We live in a vast field of energy that exists at different levels, and we partake in all of these. The subtle, invisible realm of feelings, where our thoughts and emotions are in constant activity and movement, certainly impact on the state of our physical health and we often hear stories of miraculous healing of physical pain that follows a powerful experience of emotional healing. We could perhaps think of this effect as the gravitational pull of energies downward into the body, but energy constantly flows upward too. It also happens the other way around: as we heal a physical condition, energy that has been stuck or contracted is free to move ‘upward’ or ‘outward’ to feed our energetic hearts or our souls. 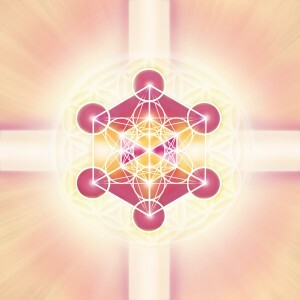 Metatron is known as the bridge between the dimensions, and in that role he helps us to become fluent and harmonious in the ongoing conversation between our own ‘heaven’ and our own ‘earth’. “I have found this form of healing to be one of the most powerful forms of healing I know. It was a great shock to me that when I thought I had healed all the ‘issues’ in my life I developed a very serious case of Bladder Cancer in 2008. At the time I was just starting the process of becoming a Metatronic healer. I did a course in Colour Healing, then the Metatronic Healing Foundation Course five weeks later. Two weeks after this I again went into hospital to have keyhole surgery to remove the rest of the tumour. Much to everybody’s surprise they found that the tumour was benign. I did the Golden Alchemy level of Metatronic Healing 12 weeks later. I again had an internal inspection of my bladder approx 2 weeks after this which again showed me to be clear. At all internal examinations since then I have been able to see on a screen for myself that my bladder is still totally clear. It is very difficult to see where the cancer had been. I can now say that Metatronic Healing was a major factor in my healing from bladder cancer in 2008.” Guy E, Surrey.